GATLINBURG - The National Park Service is closing the Chimney Tops Trail in Great Smoky Mountains National Park on weekdays while the trail undergoes major restoration. The trail will be closed Monday through Thursday from Monday, April 30 through Thursday, October 18. The combination of heavy use, abundant rainfall, and steep terrain has turned the Chimney Tops trail into a badly eroded obstacle course of slick, broken rock, exposed tree roots and mud. The hazards that now exist on the trail encourage hikers to pick their way across the uneven surface or to divert them off the edges of the trail, causing extensive soil erosion and resource damage. The Park's Trails Forever Crew will be rebuilding the trail using rock and timber. The planned work includes: Constructing rock steps to carry hikers up the steepest areas and prevent erosion; building elevated "turnpikes" -- logs laid parallel and packed with dirt, to carry the trail across wetland areas, and creating numerous "waterbars" – logs or stone partially buried diagonally across the trail to divert rainwater off the trail before it can erode the walking surface. Park managers say that the extensive use of durable stone and rot-resistant black locust timbers in the reconstruction will stabilize the trail for decades to come, reducing annual maintenance, and greatly improving the visitor experience. Tobias Miller, the Foreman of the Park's Trails Forever Crew, stated "Because of the narrow trail corridor, and steep drop-offs along the edges of the trail, we could not get the work done safely or efficiently with hikers streaming through. Much of the needed work involves moving and breaking large rock which will require extensive rigging of cable systems that will make the trail virtually impassable. Trying to accommodate hikers through the work zones with this type of work underway would be hazardous." The Park is scheduling the work so as to allow the Chimney Tops Trail to be re-opened for peak visitor use each Friday through Sunday. During the closure days the Park is suggesting alternative trails including: Alum Cave Trail which is two miles south of Chimney Tops along Newfound Gap Road, the Appalachian Trail north to Charlies Bunion, the Rainbow Falls Trail from the Cherokee Orchard Road to the falls, or the Forney Ridge Trail from the Clingmans Dome Parking Area two miles to Andrews Bald. Park managers are especially encouraging people to hike the Forney Ridge Trail, because until recently it had the same sort of problems as the Chimney Tops Trail and is an example of the kind of work that is ongoing at Chimney Tops. The Park's Trails Forever Crew is funded through a partnership between the Park and the Friends of the Smokies. The Friends are donating $121,000 this year to support the program. The Park's professional Trails Forever crew will also be reinforced by volunteers who sign up to work with the crew on scheduled workdays, as individuals or part of organized groups. 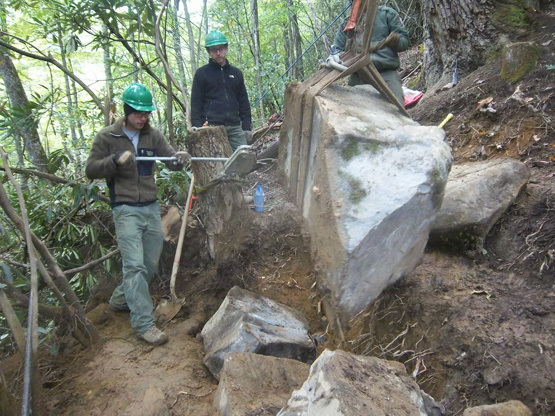 The Park invites interested trail work volunteers to visit the Trails Forever website at www.smokiestrailsforever.org or contact Trails & Facilities Volunteer Coordinator at (828) 497-1949 for more information.